list of largest public companies with a net worth of 55 billion dollars. We had a great opportunity to have a tour of the company behind these big brands to gain information about careers in the chemical industry. 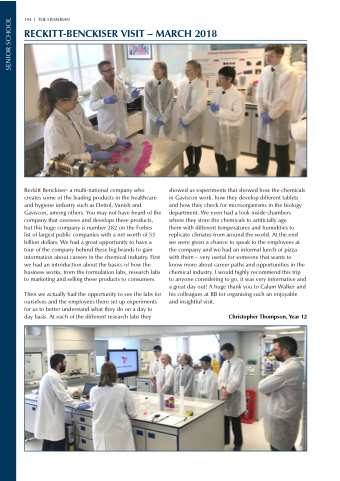 First we had an introduction about the basics of how the business works, from the formulation labs, research labs to marketing and selling these products to consumers. them with different temperatures and humidities to replicate climates from around the world. At the end we were given a chance to speak to the employees at the company and we had an informal lunch of pizza with them – very useful for someone that wants to know more about career paths and opportunities in the chemical industry. I would highly recommend this trip to anyone considering to go, it was very informative and a great day out! A huge thank you to Calum Walker and his colleagues at RB for organising such an enjoyable and insightful visit.